Oil sheen on the Columbia River in Astoria, OR. 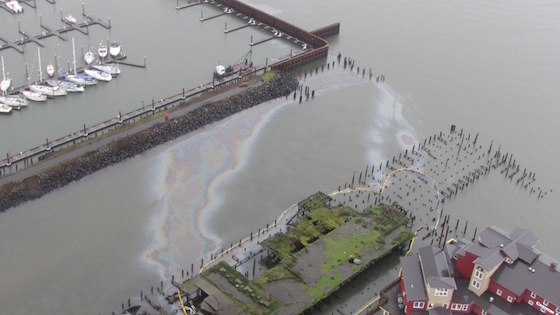 Crews are working to contain an oil spill that has created a sheen spanning five miles of the Columbia River in Astoria, OR, the U.S. Coast Guard said Saturday. The oil contamination came from a dilapidated pier near the Cannery Pier Hotel that houses the Union Fisherman Cooperative. The Coast Guard is still working to identify the source of the oil. The sheen was first spotted Thursday, but hazardous sea conditions stopped the Coast Guard from making any headway on the spill. Coast Guard Incident Management Division Astoria worked with state and local contractors to put a containment boom around the pier, officials said. High tides might have contributed to spreading the oil.